MGA Entertainment, maker of the popular line of Bratz dolls, threw another punch at Mattel (MAT) this week in their long-running fight, alleging the owner of Barbie has engaged in a long-standing practice of falsifying credentials to spy on competitors at toy fairs around the world, The Wall Street Journal reports. The allegations mark just the latest round in the knockdown, drag-out copyright infringement lawsuit the companies have been embroiled in over the past six years. 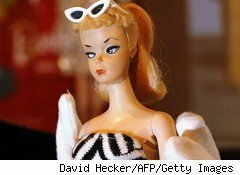 At issue: Who has ownership rights to the Bratz dolls, which have developed a strong following among tween girls. MGA's spying allegations were part of its court filings late Monday, as the parties prepare to head back to federal court for a new trial on Jan. 11. Last month, a federal appeals court overturned a lower court's ruling in MGA's favor, finding that it's "not equitable to transfer this billion dollar [Bratz] brand -- the value of which is overwhelmingly the result of MGA's legitimate efforts --" to Mattel. Previously, a lower court ruled in favor of Mattel, which alleged the initial Bratz designs were created by a Barbie clothing designer while he was under contract, before he was hired away by MGA. The lower court judge agreed, and ruled that the Bratz line therefore belonged to Mattel. After the lower court's ruling, MGA was forced to pull its line of Bratz dolls from store shelves. But girls appear to have gotten a second life, albeit more subdued, as Moxie Girls. MGA now claims Mattel's market intelligence group doctored up credentials at toy fairs to gain access to private showrooms. Once inside, MGA alleges that Mattel employees would secretly photograph new products and gather information on pricing and marketing strategies shared with retailers and distributors, according to The Wall Street Journal. After allegedly gleaning the information, MGA claims Mattel would assemble intelligence reports to be shared throughout the company, and house the information at its corporate headquarters in a ninth-floor library. maintain its unlawful competitive advantage in the toy industry, its vigorously promoted reputation as an ethical company, and most importantly of all from MGA's perspective, its ability to deceive a federal judge into believing that Mattel was good and MGA was evil. Ironically, that debate is also played out in households across America, where young adolescent girls clamor for the Bratz dolls and parents are left with a decision whether to indulge them by buying the scantily dressed dolls. In some circles, parents shun Bratz and forbid their daughters from playing with them even when visiting other children's homes. Big money is at stake for MGA and Mattel. Since its debut in 2001, the Bratz line has cut heavily into Barbie's market share among tweens, outselling the comparatively wholesome-looking icon in Britain in 2004, according to a report in the British newspaper The Telegraph.